There are places and times for pure childlike delight. We’d been through a stressful year. Death hovered too close to our family. Through the miracles of modern medicine, assisted by angels along the way, we survived. And so we ferried in September to our beloved Provincetown at the very tip of Cape Cod. We walked for miles at water’s edge, marveling at the vast ocean. Our mortal footprints disappeared as the tide returned to shore. We witnessed new dawns. Gazed at a glistening moon path on darkest nights. It was a time of contemplation and somber thankful prayers. Until that early morn. 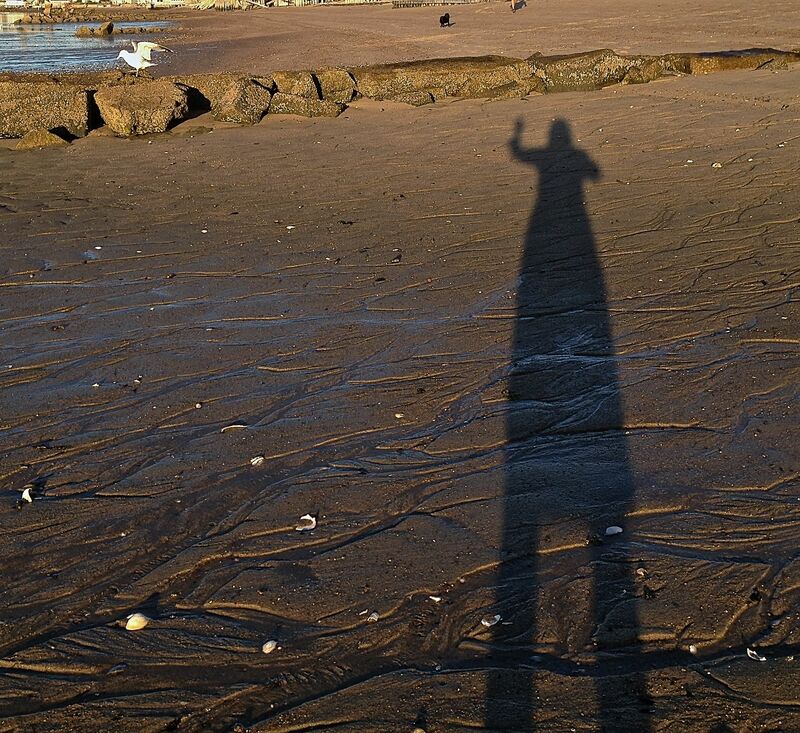 Standing in the cool sand, my shadow elongated before me. Cast like a circus lady on stilts. Like mirrors where clowns stretch tall or wide. Magnified to the absurd. And it birthed a smile. And then a chuckle. And then a laugh. Pure childlike delight far beyond my years. And it felt good. It’s Haibun Monday at dVerse, the virtual pub for poets, and Toni asks us to write about shadows. Any kind of shadows. A Haibun includes one or two paragraphs of prose and it cannot be fiction. The prose is followed by a haiku (3 lines with syllable counts of approximately 5, 7, 5). Haikus are about nature and include a seasonal word. Photo is my shadow in Provincetown. What a wonderful joyous haibun. I love how you have woven shadows of the soul in with actual shadows. It is indeed good to laugh and let the troubles of the past wash out to sea. And you were one of those lambs frolicking in freedom. You are more than welcome. I remember things you have said about this year. Oh, I agree, Lillian, that there are places and times for pure childlike delight. They are especially welcome after a difficult time. Provincetown sounds beautiful. I like the photograph you have chosen to illustrate your haibun – I have a similar one! True laughter from deep within does much to ease a difficult past. Glad you enjoyed. What joy to laugh at shadows like that… I need to remember that… a bit like having fun when making dragons with your hands. oooooh …. wonder if someone will write about “shadow art” — where you move your hands, fold them in different ways, and then the shadows they create look like animals 🙂 Haven’t thought about that in a while! It is nice how shadows elongate in the early morning or just before sunset. This really heldy attention and moved me. The joy that comes out of the shadow is strong and inspiring. Your difficult time and your response is beautifully written. I am reading a book on joy by the Dalai Lama and Archbishop Desmond Tutu. You all offer a message of getting through those dark times by allowing the joy of living and the chuckle to come through! What a wonderful comment! I truly appreciate your kind words here. You cast a long shadow indeed! Your haibun is beautifully written, and it’s easy to identify with the experience of a close brush with death occasioning time spent in deep thought. Thank you for your thoughtful comment, Bev. It is truly appreciated. I couldn’t stop smiling at the end of a very serious write. OMG–you & Toni & I all used the old radio show as impetus for our titles; great minds and all that; smile. A a photographer, I’m clicking images of my own shadow a lot; what fun. Your poem had a lovely conclusion & we need more of those for sure. Shadows truly are amazing, aren’t they? Somewhere at the beginning of my blog there’s a poem I wrote about wondering, when my shadow is cast behind me, if it still follows my exact movements or it it takes a little freedom and makes some of its own independent movements behind my back! 🙂 Wouldn’t that be something? An impish shadow! A dance through your own personal shadow stories into a shadow dance of joy…brilliant. Smiling my way through to your photo. Delightful! There’s nothing like joy after the storms of life. Beautiful hiabun. Lillian…this was awesome! I expected gloom but you turned it into joy. Lovely.